The global health community has identified priority targets for pharmaceutical R&D. The Index will analyse R&D pipelines for all these targets, as set out in a new article published in Health Research Policy and Systems. 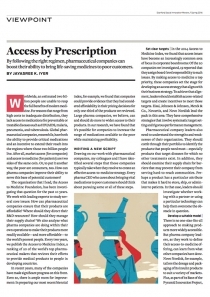 Major pharmaceutical companies contribute important expertise to health research and development (R&D), particularly in their ability to develop and bring pharmaceuticals to market. 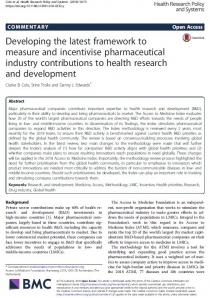 This article sets out how the research team for the Access to Medicine Index identified the priorities for these companies when it comes to directing R&D efforts towards the needs of people living in low- and middle-income countries. Two main changes to the methodology were made that will further deepen the Index’s analysis of (1) how far companies’ R&D activity aligns with global health priorities; and (2) whether companies make plans to ensure resulting innovations reach populations in need globally. These changes will be applied in the 2018 Access to Medicine Index.